Most working journalists I know wouldn’t be happy doing anything else for a living. But that doesn’t mean they’re happy with their jobs. Journalism doesn’t pay well, there are always office politics, and we could all make a lot more money working in PR. 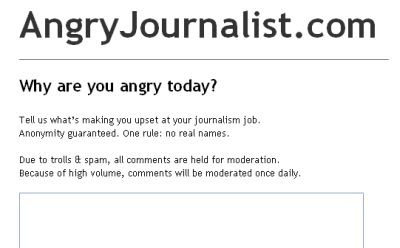 So it should come as no surprise that you can find over 400 instances of journalists venting their frustration at AngryJournalist.com. Comments are anonymous, but most of them seem to me like the sort of complaints I’d expect from journalists.